Enhance your entryway with classic style, while helping keep your floors clean, by resting this Esschert Design Cast Iron Boot Brush with Scraper in it. This traditional, hardy piece perfectly sits next to your door, its brown color with black hints enhancing virtually any setting with ease. One half of this unit sports five cast iron slats, creating a spot for you to wipe one foot at a time. Durable bristles occupy the other half of the frame, for eradicating dry dirt from shoes. The raised, center divider provides an additional scraper, and leaf and scroll shapes on it enhance the classic motif. The flared feet form a stable base for this item, and its cast iron construction lasts for many seasons. 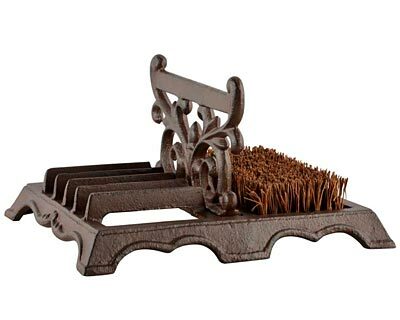 Lend timeless style to your entry with this Cast Iron Boot Brush with Scraper. Some assembly required.